The fact that it has taken an hour and a half for me to update my blog tonight demonstrates a perfect metaphor for my day; slow, long, frustrating and stressful. Long day= short post. I don't think these pictures really do this outfit justice. It's actually the same top and blouse as Monday (I know, I'm so hot) without the jumper. I thought you needed to see this gorgeous blouse in all its polka dotty glory. I had a bit of a cardigan meltdown this morning though. I originally had gone for it unbelted, and thought I'd give belting it a lot. I was worried it would make my hips look huge, which it kinda does, but it looks so much better than without. This skirt is also too big, so it helped keep the skirt in place too. I love this outfit though. I really love maroon and beige together at the moment. Today has been tiring and stressful and I really don't want to be writing this at 10.30pm, but out internet got cut off today (urgh, long story) so I'm desperately trying to catch up. Even with an iPhone with 3G, not having the internet is weird and scary. It was amazing how little I could get on with in my day without it. These pictures aren't too amazing either cause I took them right at the brightest part of the day because taking them was one of the few things on my to-do list that didn't need the internet. I kept getting in the way of a builder man who needed to use the alley I was in. I like to think we're friends now. I did really enjoy my dance classes today though, tried to calm myself down regarding my dissertation and general essay stress and picked up my newly altered clothes. I am now BFFs with the tailors. I have lots of things I want to take in and get altered. They did such a good job. Next stop is a dress I want turning into a skirt and then some shorts circa my 18th Birthday. Well, tomorrow I want to get up early to avoid late-onset dissertation meltdowns, then I have work all day, dance classes and a skype date with my American BFF Michelle. I'll be back on Friday!! 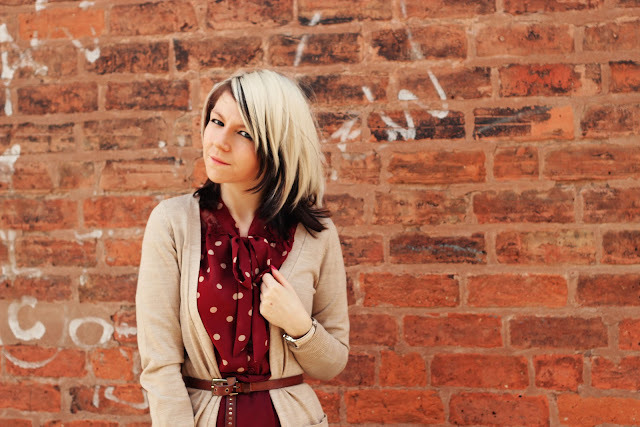 Oh and also, thanks to all your wonderful votes, I won the Matalan Style Project! Thank you so, so much for voting for me- you guys are amazing!! I really love this outfit :)love the colors of it. 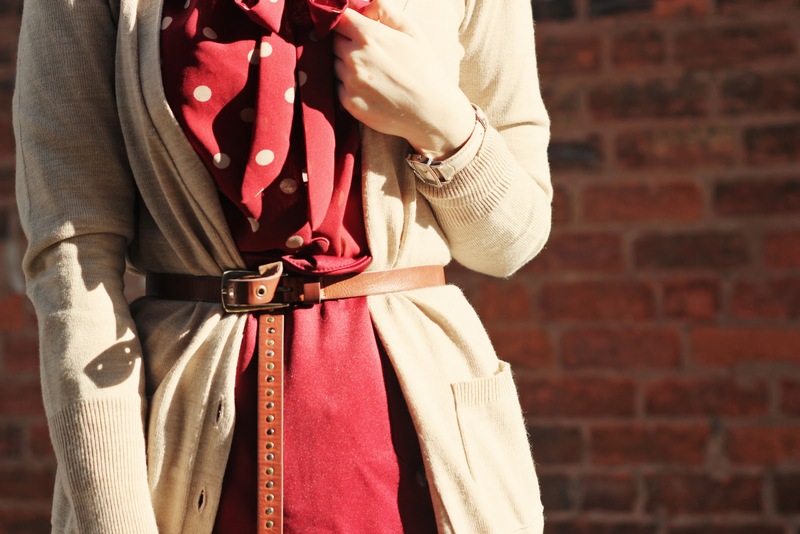 maroon and beige look beautiful together! I love the polka dots on that top and the other little details such as that amazing belt and those socks! Oh, I love this outfit! I have a similar long cardigan and sometimes when I belt it, it gives me the wide hips look that you mentioned. I like so much your blog. check out mine and if you like follow me. oh man congrats! I really really like this outfit. That dress is 10 times adorable. Your hips don't look huge, shhh :p I really like those socks. I got some wicked thigh-high leg warmers, but I still aught to have some tall socks. I really dig the maroon and beige together too. You've inspired me to find a tailor. Especially after I ordered an amazing vintage dress and it wound up being waaay too big hah. that looks like a dress, so gorgeous!! the belting is great, i think you look wonderful. You look lovely! I agree: maroon and beige are perfect together. And I'm jealous of your ability to wear thigh-high socks. Mine always roll down and/or cut off my circulation. Have a happy weekend! That blouse is gorgeous (: Also, the Oxfords are quite nice - I tend to find them mannish, but those are really feminine and go perfectly.